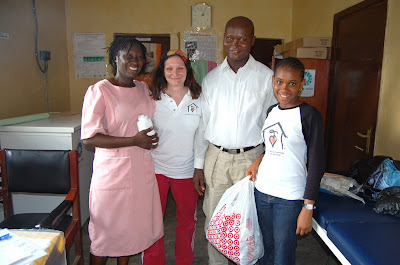 The first week of the NHA Salone Mission 2008 (September 6th through September 22); the rains became particularly heavy one night in Freetown. The rain was coming every night and we would have some sun during the day during this trip, however, this night...the rain just kept falling. It was the heaviest rain I have ever encountered. 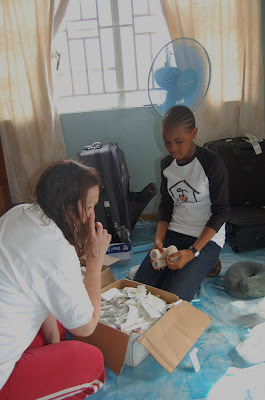 The day prior we had made our second visit to Kroo Bay delivering medical supplies to the Clinic. From the moment we first stepped foot into Kroo Bay, we knew immediately that they would receive our support and our hearts. Kroo Bay is the slum area of Freetown. The population lies pushed up unto the ocean. 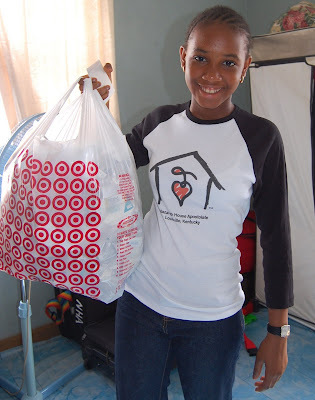 They are especially vulnerable to flooding and this rainy night proved fatal to ten souls. "May the souls of the faithful departed rest in peace..."
4. 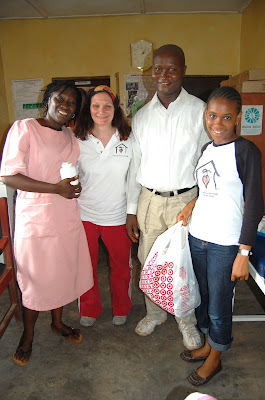 Adama B, nurse; Vicki Hicks, Gibrilla Timbo, Community Health Coordinator; Lucy Mansaray (holding supplies in bag). The remaining photos are of the heavy rains shot from the porch of St. Laurence House, Freetown.